Any triangle has both an incircle (tangent to its sides) and circumcircle (through its vertices). 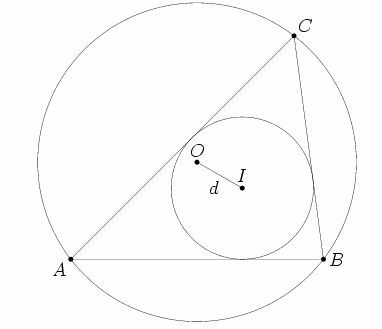 A convex quadrilateral however need not have an incircle or circumcircle in general. For it to have an incircle (i.e. a tangential quadrilateral), its pairs of opposite sides must have the same sum. For it to have a circumcircle (i.e. a cyclic quadrilateral), its opposite angles must be supplementary. One that satisfies both of these properties is called a bicentric quadrilateral. where and are the quadrilateral’s side lengths. Isn’t it cool how similar these formulas look for the triangular and quadrilateral cases?! Both of these results (and indeed Euler’s theorem) follow from the intersecting chords theorem. Fuss’s theorem can be shown by proving that both sides of the equation are equal to . Carlitz’s identity can be shown via the preliminary result that , where is the intersection of line with the circumcircle. A beautiful proof of Fuss’s theorem due to Salazar (using little more than a short angle chase and the theorems of Pythagoras and Apollonius) is found in  while that of Carlitz can be seen from p154 of . 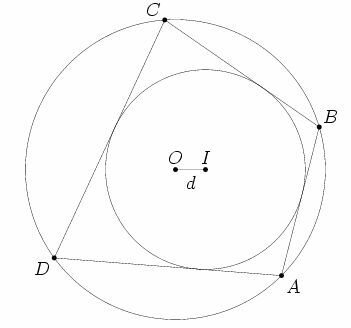 By Poncelet’s Porism, it is true that if we start with two circles of radius and with distance between their centres such that the Fuss equation is satisfied, then a bicentric quadrilateral with those parameters may be constructed. Simply start at any point on the circumcircle and successively draw tangents to the incircle to generate the other three vertices of the quadrilateral. This was how I drew the above bicentric quadrilateral. A. Bogomolny, Fuss’ Theorem from Interactive Mathematics Miscellany and Puzzles http://www.cut-the-knot.org/Curriculum/Geometry/Fuss.shtml#S, Accessed 30 December 2011. Science is tremendous, Mathematics is magic !